During the winter as you observe the bare appearance of plants, do you ever wonder how plants survive the climate challenges they annually endure? Animals have fur, migration, hibernation and estivation to help alleviate weather changes, but plants are primarily confined to specific locations during drought, floods and intense temperatures of heat and cold. Yet, despite these limitations, plants have evolved to reproduce and flourish in arctic, temperate, tropical, wet and desert conditions. 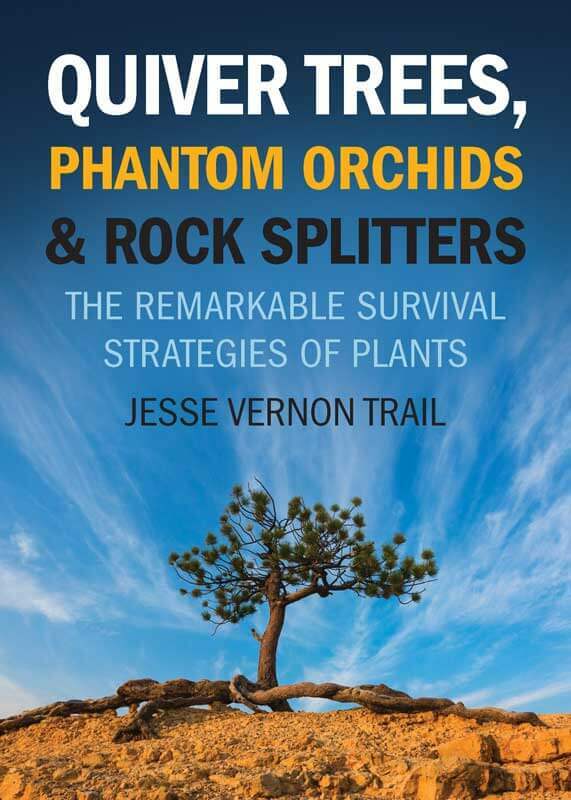 Quiver Trees, Phantom Orchids & Rock Splitters (ECW Press, 2015) by Canadian author Jesse Vernon Trail offers fascinating explanations of “the remarkable survival strategies of plants.” The first chapters explain the adaptations plants have made to succeed in pollination, seed development and dispersal, and other means of reproduction. As in all sections, these chapters are filled with numerous photographs and interesting examples. For instance, Trail relates the island of Crete’s stork’s bill plant whose spiraled-shaped seeds plant themselves by twisting and turning into the soil after catapulting from its stems. After discussing plants’ special protections from extreme natural phenomenon, the author becomes the guide to a botanical travelogue. His chapters on arctic, alpine, desert, rain forests and Mediterranean climates sprint from place to place within continent to continent. His descriptive details create the locations and its plant life clearly in one’s imagination. Continuing these verbal tours, Trail moves on to more aspects of plant existence. Thorns, poison and carnivorous and parasitic plants are explained as merely deploying defensive and offensive forms of protection. The size variation of aquatic plants is revealed to vary from the world’s smallest flowering plant, duckweed, to the six-foot diameter of the Amazon water lily. Plants resistance and dependence on fire is made more interesting by the example of the national flower of South Africa, the King Protea. This plant protects its mature seeds on colorful 10-inch flowers by covering them with an asbestos-like fiber that breaks only after enduring the heat and flames of an intense brush fire, which then releases the seeds and ensures the regeneration of the plant. Trail’s final chapters deal with what he calls “fascinating and unusual survival strategies” for plants. He gives examples of plants that each have unique characteristics such a one that grows completely underground, another “sleeps” at night, and the cannonball tree that produces pieces of fruit weighing 50 to 100 pounds each. These introductions to some of the world’s oddest, most beautiful, efficient and effective plants will not allow you to lapse into boredom while reading this book. So conquer your winter hibernation by curling up beside a blazing fireplace and traveling via imagination to far-away locations to study exotic plants.